After I read this story, I had to give some thought to the idea that “we lose something important in the rush toward first-person takes” (Eve Fairbanks). @zeynep point taken, but I don’t know. Not sure what beliefs you’re attributing to folks touched by his story. Then I wanted to see the context, so I read it. The mother of the 13-year-old gives many examples of replies that Siri (Apple’s “intelligent personal assistant” that responds to spoken questions) gives to the boy. I learned a number of new things as I read the essay (most definitely a personal essay), and so I felt my knowledge and empathy had been expanded. I consider that a very good thing. If that’s not in the public interest, I don’t know what is. And serving the public interest is Mission No. 1 of journalism. 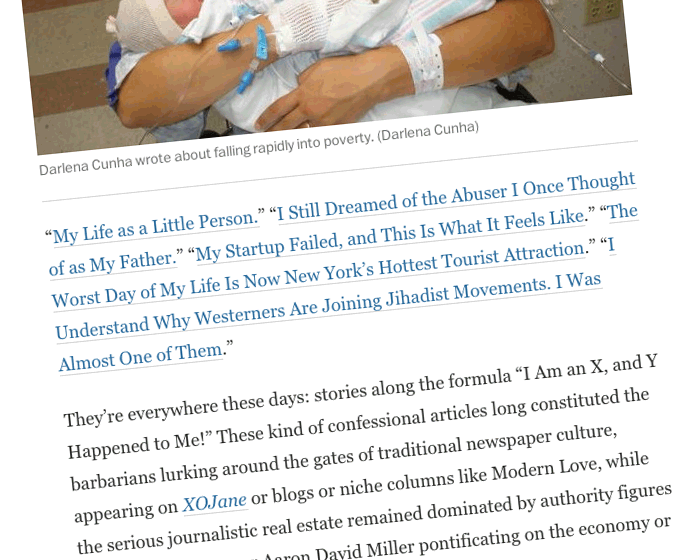 So, about that essay (not a personal one) by Eve Fairbanks in The Washington Post (Oct. 10): She characterized these as “stories along the formula ‘I Am an X, and Y Happened to Me! '” Under that precise definition, maybe the Siri/autistic boy essay does not qualify. Maybe that’s splitting hairs. Let’s lump it in there, for the sake of argument, because one mother’s story about her own child sure qualifies as first-person personal in my book. If you start telling all the journalists that because personal essays are “actually faster and easier to produce than reporting,” they contribute to the cheapening of real, serious Journalism with a capital J, you’re ignoring that value — serving the public interest. Just to be clear, I DO NOT MEAN “what the public is interested in” (the classic definition of soft news, as compared to hard news, which is “important”). I mean serving the Public Interest in terms of serving the Common Good and making all of us Better People who are less ignorant and thus better qualified to Self Govern. Interestingly (and I say that without irony), Fairbanks wrote wrote a post very much in the personal-essay vein in August. It’s nowhere near as effective as Judith Newman’s essay about Siri and her son, because it’s — well, it’s not personal enough. I’ll let you decide if I’m wrong. I did not learn — in ways that expanded my capacity for empathy and compassion — when I read Fairbanks’s essay. When I read Newman’s, I did. When I did a Google search for first person journalism, I saw a lot of interesting links. Here are three. Does this apply to Newman’s essay about Siri and her son? I say no. Most certainly, no. Steve Buttry addressed the value of first-person essays in a post about journalist Jeff Edelstein’s account of falling asleep at the wheel with his son in the car. In February, 2013 Pulitzer Prize finalist Kelley Benham gave a talk about writing in the first person, at the Indiana University j-school. In Benham’s case, the story she told was about her experience of having a very premature baby (23 weeks, six days). So let’s not lump all the first-person true stories together. Sure, there ARE cheesy “This happened to me!” stories. I think that’s not even new. There are also mind-blowingly wonderful first-person accounts that expand our small worlds and enlarge our understanding.